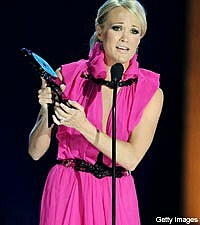 "This is very special to me," Carrie said upon accepting her first award, thanking the fans. "You guys are what makes all of us. 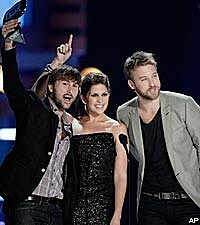 We couldn't do what we do without you guys." Miranda Lambert also thanked fans in her acceptance speech for Female Video of the Year for 'White Liar,' in an upset win over Taylor Swift ('You Belong With Me'), Carrie Underwood ('Cowboy Casanova') and Reba McEntire ('Consider Me Gone'). See the full list of winners and nominees after the jump. Flip through pictures of country's stars as they arrive at 2010's CMT Awards.